Social media giant Facebook has made update to its web version of its platform. Facebook has rolled out an update for web inbox. Facebook web inbox will now updated like Facebook messenger. This update will give you access to more customization option. Facebook users spotting the new interface in the U.S., New Zealand and Europe. 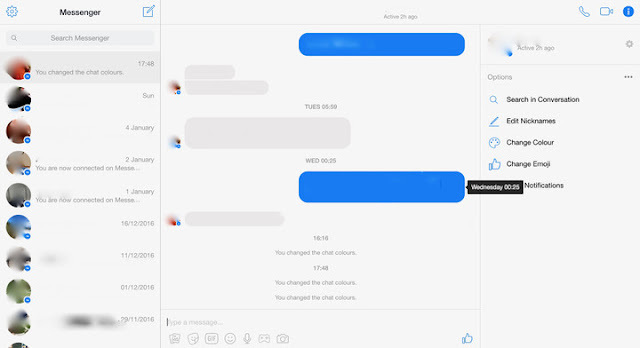 The changes you will notice if you have access to the new interface is the Messenger icon where the old speech box icon for messaging used to be on Facebook. By clicking on it, users will be given option to view all messages in Messenger that will take user to the new look inbox. User will find all chats arranged neatly below the search bar on the left side bar with most recent chats. On the right side bar user can have number of customization option that will include the ability to change the conversation's color, editing nicknames, emojis, to mute notifications and search within chat. This will add some playful elements to the conversation. The same side bar will lets you access the recipient's profile and your shared photos. Users can make voice and video calls and can access all the settings that were available in past. Facebook has not officially said anything, Messenger head David Marcus did refer to the update in the comments section of a post. Marcus writes : "We basically want to satisfy the ask of harmonizing the user experience and the capabilities of Messenger across all platforms." Marcus did not give too much away in terms of future updates to the Messenger platform.